We just had fun going fast, slow, playing with the Tiger’s because they are one fun, versatile and comfortable bike! Adventure motorcycling … why do it? We work and work so we can try to get away from the mundane routine of everyday life. How? We ride dual sport motorcycles. Not an easy way to vacation and not for everyone. Why do it? It’s a freaking blast! There are many ups and downs and the real common denominator is the weather. 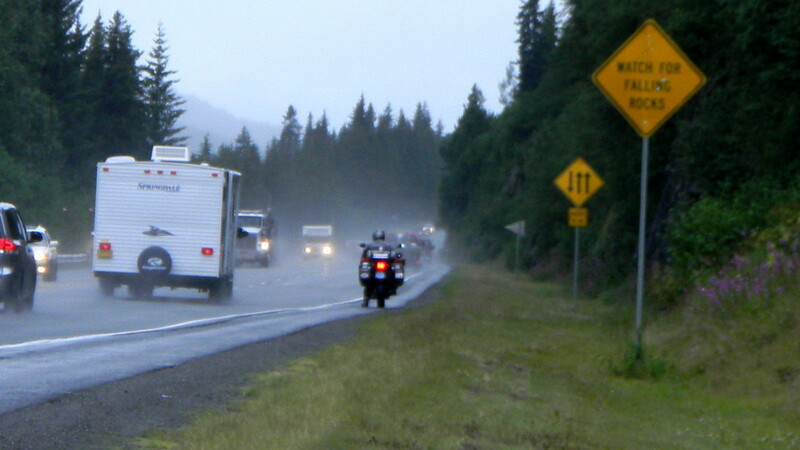 Weather is key when traveling for anyone, but on a bike? It’s one of the most important factors that tells us where we can go at times or how we are going to plan our day. Weather can mean a days ride going from 6 hours too much more than expected. That is why we always are referring to the temperature and climate. We have been on the road for 30 days. 24 have been actually riding days. Out of the 24 days we have had only 2 days without some sort of rain. The temperatures have gone as low as 3 degrees Celsius, about 36 F and we have had one day when the thermometer reached 30 C/90F. Average temperature has been between 3 – 9 C in the mornings and 8 – 18 C average afternoons. Summer in Alaska for 2011 has been one in which we are so psyched we have come prepared. We are managing to stay warm and dry everyday. Our gear, KLIM Traverse and Gerbing’s Heated liner and gloves have been used daily at one time or another. Our Triumph boots have kept our feet completely dry and our socks nice and toasty. We have learned to stay warm even in our tent when the temperature often gets below 6 C/42 F. Despite all the wet weather, British Columbia,Yukon and Alaska still have a charm about them and a beauty that is really hard to describe. Even pictures do not show off these 3 beautiful places on earth. Exploring the North has been such an awesome experience. Cheryl pointed out that we have been on almost all the major roads in the North except the Glenn Highway between Wasilla and Glenallen. On pavement or off-road I think we have done it or will do it. The big one’s, The Robert Campbell Highway, many told us not to ride this road but we loved the secluded feeling, no traffic but a lot of dust until we got near Ross River when it rained. The Dempster, made it to the Arctic Circle but decided due to really bad weather in Inuvik to turn around at that point. Still got poured on for 360 KM heading out. Top of the World, spectacular day to ride this road and you really feel like you are riding a ridge with panoramic views from all sides. The Dalton to Deadhorse, more rain but we did it. Even rode from Deadhorse all the way back to Fairbanks in one day. 800 KM with our new friend Ray Jardine. He is famous don’t you know. Denali Highway even in the rain beautiful and such a great road to be on a bike. We got a view of McKinley from there. The last one to date was the McCarthy Highway to McCarthy. This was seriously fun road to ride, dusty, rocky, dirty and ton’s of pot holes and craters. Oh and don’t forget the major paved one’s too, we’ve done them too. I think we have some more dirt to tackle on our way home but that is it for now. The Triumph Tiger’s? What do we have to say about these bikes now? We LOVE them. At this point we now have a little over 10,000 KM (6213 miles) on the bikes and they have made the paved portion of this trip extremely comfortable which has been a blessing on these rough roads. The power of these bikes never fails going up steep mountains or passing a truck in 5th gear. The gel seats Triumph loaned us are absolutely in our books top-notch and super comfy. Off road? Don’t let anyone tell you they are not good off-road. See the roads we have done? The Tiger’s did great, almost flawless except that little stalling issue. A problem that was fixed and in a very timely manner by the guys at The Motorcycle Shop in Anchorage. Also, thanks for Triumph getting us back on to road too. If you ride like us, the Triumph Tiger is in a league of it’s own. We call it a great street touring bike that LOVES being off the pavement. Get the right tire, we are using the Heidenau K60 Scouts and they have also been a part of the off-road experience. Still have plenty of tread and life and reliable as always. Everything about this bike screams take me anywhere and I will get you there. Comfort, power, good looks, decent gas mileage, not great but decent, really good suspension that makes this bike #1 dual sport bike in our books. The scenery is beautiful and at times breath-taking and overwhelming. Hard sometime to focus on riding too. I have only posted some of the pictures I have taken there are too many. The people we have met are amazing. The other ADV riders, always nice to hear their story or plight. The partnership Cheryl and I have works. Yeah we annoy one another but we love each other and got one another’s back. Ying and Yang. We both highly recommend getting up here and challenge yourself. Ride every where and one word of advise, if you wait for better weather to ride a road like the Dempster or Dalton, don’t. They are too long and weather changes daily on these roads. Go for it! Only a few weeks left and we both feel we could stay away for another 6 months at least. Tired but looking forward to seeing places we have never seen before. It has been really interesting having so many people follow us virtually. I am especially enjoying keeping everyone updated. So, 1 month check in… and will savour these last few weeks because it will be over before we know it.